This article is about the novel. For the film adaptation, see Coraline (film). For other uses, see Coraline (disambiguation). Coraline /ˈkɒrəlaɪn/ is a dark fantasy children's novella by British author Neil Gaiman, published in 2002 by Bloomsbury and Harper Collins. It was awarded the 2003 Hugo Award for Best Novella, the 2003 Nebula Award for Best Novella, and the 2002 Bram Stoker Award for Best Work for Young Readers. 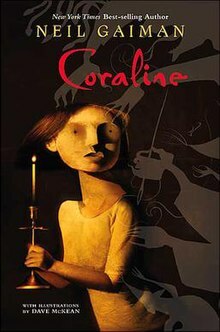 Gaiman started writing Coraline in 1990. The titular character's name came from a typo in "Caroline". According to Gaiman, "I had typed the name Caroline, and it came out wrong. I looked at the word Coraline, and knew it was someone's name. I wanted to know what happened to her." It has been compared to Lewis Carroll's Alice's Adventures in Wonderland and has been adapted into a 2009 stop-motion film, directed by Henry Selick. Coraline Jones and her parents move into an old house that has been divided into flats. The other tenants include Miss Spink and Miss Forcible, two elderly women retired from the stage and Mr. Bobo, initially referred to as "the crazy old man upstairs," who claims to be training a mouse circus. The flat beside Coraline's is unoccupied, and a small door that links them is revealed to be bricked up when opened. Coraline goes to visit her new neighbours. Mr. Bobo relays to her a message from his mice: "Don't go through the door." Coraline also has tea with Miss Spink and Miss Forcible, and Miss Spink spies danger in Coraline’s future after reading her tea leaves. Despite these warnings, Coraline decides to unlock the door when she is home by herself. This time, she finds the brick wall behind the door is gone. In its place is a long hallway that leads to a flat identical to her own, except inhabited by the "Other Mother" and "Other Father," who have black buttons for eyes. The Other Mother is notably taller and thinner than her real mother. Her black hair seems to move by itself, her skin is paper-white, and her nails are long and red. Coraline finds the "Other World" more interesting than her own; the Other Mother cooks food that she actually enjoys, both of her Other Parents pay more attention to her, her toy box is filled with animate toys that can move and fly, the Other Miss Spink and Miss Forcible perform a never-ending act in their flat, and the Other Mr. Bobo performs a mice circus. She even finds that the feral black cat that wanders around the house in the real world can talk. The cat identifies itself as the same cat that lives in the real world, and possesses the ability to travel through the gaps between the two worlds. Although intentionally rude and unhelpful for the greater part of the conversation, it briefly praises her for bringing "protection," then vanishes. After Coraline returns to the copy of her flat, the Other Mother offers Coraline the opportunity to stay in the Other World forever, but in order to do so, Coraline must allow buttons to be sewn into her eyes. Coraline is horrified and returns through the door to her home. Upon return to her apartment, Coraline finds that her real parents are missing. They do not return the next day, and the black cat wakes her and takes her to a mirror in her hallway, through which she can see her trapped parents. They signal to her by writing "Help Us" on the glass, from which Coraline deduces the Other Mother has kidnapped them. Though frightened of returning, Coraline goes back to the Other World to confront the Other Mother and rescue her parents. In the garden, Coraline is prompted by the cat to challenge the Other Mother, as "her kind of thing loves games and challenges." The Other Mother tries to convince Coraline to stay, but Coraline refuses, and is locked within a small space behind a mirror as punishment. In the small dark closet space, she meets three ghost children. Each had in the past let the Other Mother, who they archaically refer to as the "beldam," sew buttons over their eyes. They tell Coraline how the Other Mother eventually grew bored with them, leaving them to die and cast them aside, but they are trapped there because she has kept their souls. If their souls can be rescued from the Other Mother, then the ghosts can pass on. The ghost children implore Coraline to escape and avoid their fate. After the Other Mother releases Coraline from the mirror, Coraline proposes a game: if she can find the ghost children's souls and her parents, then she, her parents, and the ghost children may go free. If she loses, then Coraline will let the Other Mother sew the buttons into her eyes and become a loving daughter to her. The Other Mother agrees and they both swear on their right hands. Coraline searches through the Other World and overcomes the Other Mother's obstacles by using her wits and Miss Spink's lucky stone to find the marble-like souls of the ghost children. She also deduces that her parents are imprisoned in a snow globe on the mantelpiece. The ghost children warn her that even if Coraline wins, the Other Mother will not let them go, so Coraline tricks the Other Mother by announcing that she knows where her parents are hidden: in the passageway between the worlds. The Other Mother cannot resist gloating by opening the door to show Coraline that her parents are not there. When the Other Mother opens the door Coraline throws the cat at the Other Mother, grabs the snow globe, and escapes to the real world with the key, and the cat quickly follows. While escaping, Coraline forces the door shut on the Other Mother's hand. Back in her home, Coraline falls asleep on a chair. She is awoken by her parents who have no memory of the events. That night, Coraline has a dream in which she meets the three children at a picnic. The children are dressed in clothes from different periods and one seems to have wings. They warn her that her task is still not done: the Other Mother will attempt to get her back and will try to get the key to open the door between the worlds. Coraline goes to the old well in the woods to dispose of the key. She pretends to have a picnic, with the picnic blanket laid over the entrance to the well. The Other Mother's severed hand attempts to seize the key, but steps on the blanket and falls into the well. Coraline returns to the house, greeting her neighbours (who finally get her name right), and getting ready for school tomorrow. Coraline Jones – The young explorer. She is curious, intelligent, resourceful, and courageous. Coraline is often irritated by rain, crazy grown-ups (as they all seem to be), and not being taken seriously because of her young age. She's described as being "small for her age", but Coraline is not afraid to face anyone; she is the most adventurous person in the book. Mrs. Jones – Coraline's mother. She is very busy most of the time, and sometimes a little inattentive, but she loves and cares about Coraline. She is nice, and helpful, though Coraline considers her to be rather boring. Coraline also gets annoyed with her real mother because she doesn't seem to want to let Coraline "fit in". In the film, her first name is Mel. Mr. Jones – Coraline's father. He works at his house on the computer. He cares about Coraline very much and is kind, brave, and helpful. He makes interesting food creations that Coraline strongly dislikes. He, too, is usually too busy to spend time with Coraline. In the film, his first name is Charlie. The Cat – A black cat from Coraline's world. The cat acts as a mentor to Coraline and guides her through her journey. It claims to have no name, explaining that cats do not need names to tell each other apart. Unlike many of the characters in the novel, it does not have an "Other World" counterpart, saying that unlike other creatures in the world, cats can "keep themselves together". It moves freely from one world to the other, although it seems to be only able to talk in the Other World. It is very sarcastic, though helpful to Coraline. It's defiant of the Other Mother, but seems to tremble at the thought of being stuck in the Other Mother's world. It befriends Coraline and helps her escape from the Other Mother, though Coraline also uses it as a weapon without its permission. The Other Mother – The creature that created much of the Other World and the main villain of the novel. She looks similar to Coraline's real mother but taller and thinner, with long black hair that seems to move by itself, black button eyes, paper-white skin, and extremely long, twitchy fingers with long dark red nails. During the course of the novel, she grows taller, thinner, and paler, looking less and less like Coraline's mother. She cannot create, but only copy, twist and change things from the real world when constructing her version of it. She collects children, whom she loves possessively to the point of eventual destruction. She mainly wants someone to mother. It's implied that she killed her own mother because when Coraline asked her if she had a grave she replied "Oh yes, I put her there myself." In the film her true form is a skeletal-arachnoid creature. She is referred to several times as "the beldam", a Middle English word meaning "grandmother", "ugly old woman", "hag", or "witch", and also used to refer to creatures of fairy. The Other Father – A creation of the Other Mother, the Other Father is used to help trick Coraline into staying in the Other Mother's world. Like her real father, he has a study and sits there during the day and will not talk to Coraline for long. He does not work, however; he merely occupies the study, as he is not permitted to talk to Coraline by himself. He is much more fun than Coraline's real father and always tries to be cheerful and fun in front of Coraline. In reality, the Other Father is sad and nervous. The Other Mother ends up punishing him for revealing too much to Coraline—she transforms him into a grub-like creature, and orders the Other Father to trap Coraline so she cannot win her challenge, but Coraline escapes. Miss Spink and Miss Forcible – A pair of retired actresses who live in the flat under Coraline's. They own many ageing Scotties, such as Hamish, Angus, and Jock, and talk in theater jargon, often referencing their time as actresses. They recognize the danger Coraline is in after reading her fortune through tea leaves and give her a stone with a hole in it to help protect her. In the Other World they are young, pretty, and perform continuously in front of many different dogs, who, in the Other World, are anthropomorphic. The three ghost children – The spirits of three children who were previous victims of the Other Mother: two girls and one boy. The boy is described as having a dirty face and red trousers. One of the girls has brown hair, a pink blouse and a pink skirt. The other has a brown bonnet and brown dress. They were trapped by the other mother at different times before Coraline, and reside in the dark space behind the mirror. After having their souls restored, they go to the afterlife, but not before meeting Coraline for a last time, in a dream where she picnics with them. Here, she sees their true appearances and they thank her for freeing them from the Other Mother. They also warn her that the other mother is not done with her. Coraline inspired the "Coralisa" segment of The Simpsons episode "Treehouse of Horror XXVIII", which aired on 22 October 2017. Neil Gaiman provided the voice of the Simpsons' cat, Snowball V.
With the help of the animation studio Laika, director Henry Selick released a stop motion film adaptation in 2009 that received critical acclaim. At the 82nd Academy Awards, the film was nominated for Best Animated Feature but lost to Pixar's Up. In the film, Coraline is depicted as having short blue hair and freckles. Henry Selick added a new character, Wyborn "Wybie" Lovat, who is an annoyance at first to Coraline in the real world but she grows to like him. In the Other World he cannot speak, but is an ally to Coraline. At the end of the film, Coraline reaches out to help Wybie tell his grandmother what is behind the little door. A comic book adaptation, published in 2008, was illustrated by P. Craig Russell and lettered by Todd Klein. A theatrical adaptation, with music and lyrics by Stephin Merritt and book by David Greenspan, premiered on 6 May 2009, produced by MCC Theater and True Love Productions Off-Broadway at The Lucille Lortel Theatre. Nine-year-old Coraline was played by an adult, Jayne Houdyshell, and the Other Mother was played by David Greenspan. A video game adaptation, based on the film, was published and developed by D3 Publisher of America. The game was released on 27 January 2009 for the PlayStation 2, Nintendo DS and Wii platforms and contains features such as playing as Coraline, interacting with other characters, and playing minigames. The game received mostly negative reviews. An opera by Mark-Anthony Turnage, based on the novella, made its world premiere at the Barbican Centre in London on 27 March 2018. ^ "The theatrical trailer for Coraline". 22 January 2009. Retrieved 8 December 2010. ^ "The Hugo Awards : 2003 Hugo Awards". World Science Fiction Society. Archived from the original on 7 May 2011. Retrieved 25 October 2009. ^ "The Nebula Awards". Science Fiction and Fantasy Writers of America. Archived from the original on 28 August 2008. Retrieved 25 October 2009. ^ "Past Stoker Nominees & Winners". Horror Writers Association. Archived from the original on 20 November 2011. Retrieved 25 October 2009. ^ Schwartz, Dana (18 October 2017). "Neil Gaiman would love to see a Sandman parody on The Simpsons". Entertainment Weekly. Retrieved 29 October 2017. ^ Smith, Zack (19 August 2008). "P. Craig Russell – Adapting Coraline and More". Newsarama. Retrieved 27 October 2011. ^ a b Blankenship, Mark (7 June 2009). "The Score and the Story, Inseparable". New York Times. pp. AR4.